After finally checking-in on our respective dorms, my friend and I agreed to meet at my hostel’s lobby. We planned to head out and explore the streets of Bangkok. It was funny that we were on different hostels. When she tried booking a reservation at Bed Station Hostel, all beds were already taken. Fortunately, a budget accommodation on the same compound still has beds available. 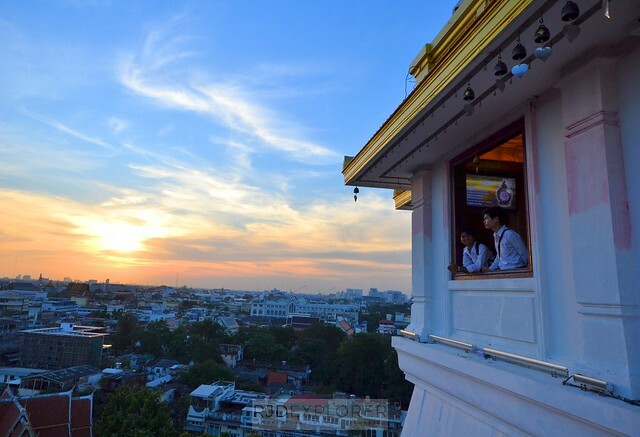 Our goal that afternoon was to climb Wat Saket and witness a glorious sunset in Bangkok. My friend already stayed in Bangkok for several weeks in the past and she wanted me to experience the canal taxi boats. Our accommodations are only a few blocks from one of the stations so we just walked towards Phetchaburi Road. Passing by several shopping centers, we arrived at one of the stations. We didn’t check the destination but immediately hopped on the vessel. 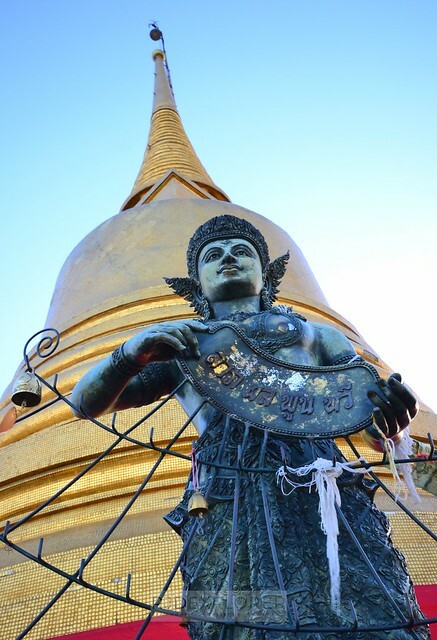 My friend started to introduce some of the Thai culture she was able to observe during her previous visits. During our conversation, I glanced on my Google map and noticed that the boat keeps on going in the opposite direction. Canal taxi experience in Bangkok. Alarmed, I told her that it seems that we boarded a boat heading in a different direction. When we confirmed it, we instantly threw ourselves out of the vessel on the nearest station. Helpless, we walked a few blocks to look for cabs that can bring us to Wat Saket. Unfortunately, all taxi in that area was occupied. Few more blocks and we bumped into some motorbike drivers. We mentioned our destination but they were hesitant to give us a ride. They just volunteered to bring us to the nearest BTS station. From the Chit Lom BTS station, we took the train up to National Stadium where we flagged a taxi to Wat Saket. It was a fine afternoon and we were able to try four different rides in Bangkok. When we remembered that we still haven’t had lunch, street vendors selling grilled barbecue and papaya salad became our heroes. Wat Saket is a famous temple in Bangkok. Not renowned as Wat Pho or Wat Phra Kaew in terms of visitor arrivals but it’s one of the most unique temples the city has. On a hill, Wat Saket towers the city offering a sweeping view of Bangkok. 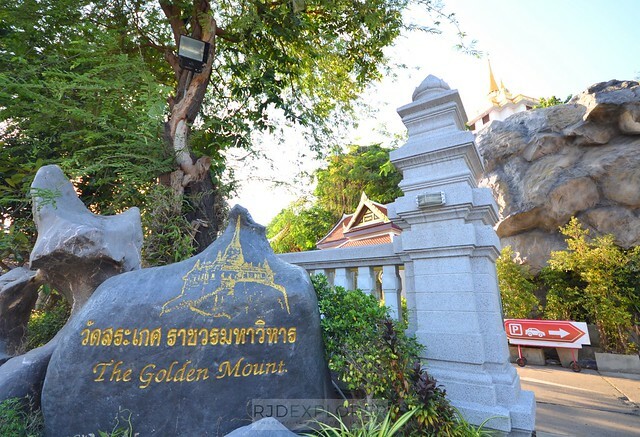 The temple is tagged as the Golden Mount because of the golden chedi on the hill. The hullabaloos we had were perfectly timed for sunset. We paid THB50 each for the admission fee. By the way, the temple is open from 7:30 AM to 5:30 PM so better to visit the temple within these hours. 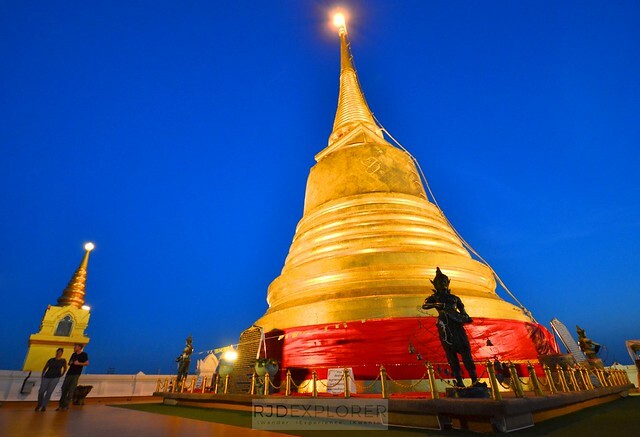 There are around 340 steps from the ground to the main deck of the temple where the massive chedi is located. 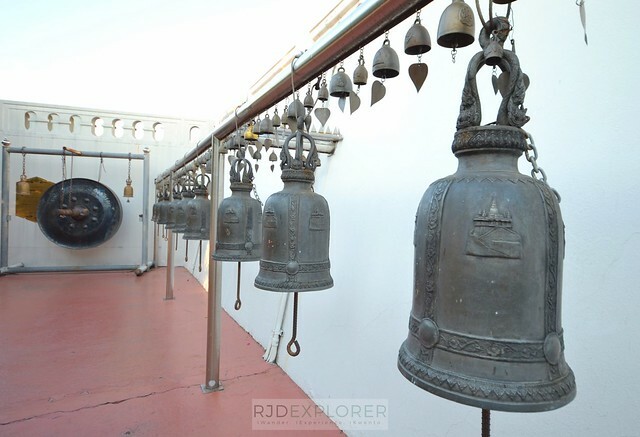 Along the way are some bells and gongs that tourists can ring. A café, serving beverages and light snacks, is midway to the temple on the hill. 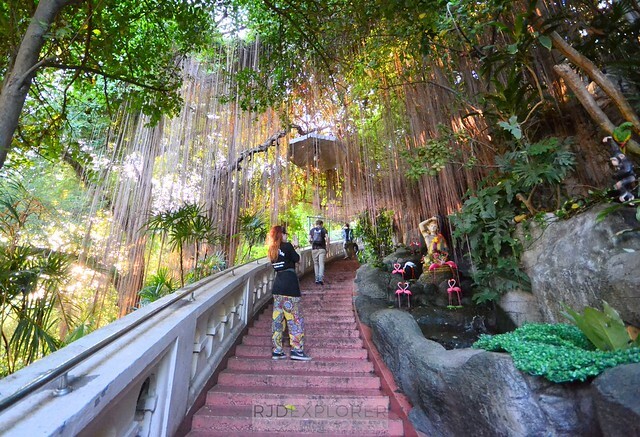 The climb will reward you with a sweeping view of Bangkok and this is amplified during sunset with the golden colors. Since the temple is not that accessible compared to the more famous ones like Grand Palace, Wat Pho, and Wat Arun, visitors of Wat Saket are mostly locals visiting to pray during the day. But due to most tourists’ recommendations, foreign travelers crowd the temple, especially during sunset. Wat Saket during blue hour. 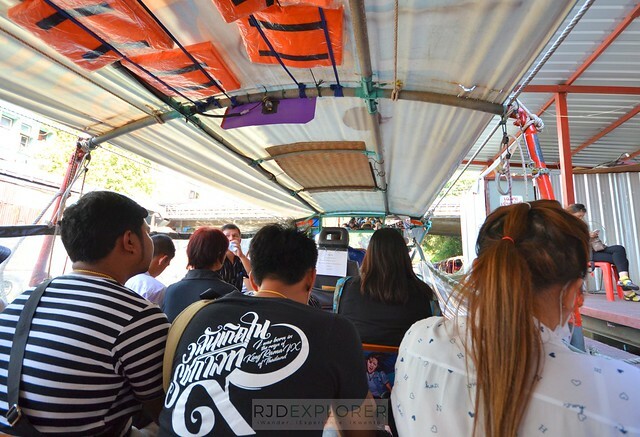 Transportation means like water taxi, motorbikes, trains, buses, to taxi, only prove that Bangkok can be explored easily. Getting lost is considered as misadventures by many but this will allow you to be more careful and understand and appreciate the transportation system available. 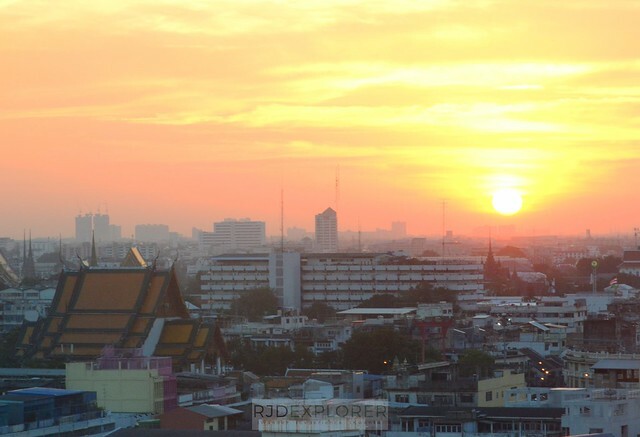 At times, these mishaps end with a stunning reward similar to an impressive sunset at Wat Saket. My love hate relationship with the Bangkok canals, all because of the smell! hahaha… sometimes hindi sila ganun ka amoy minsan naman mahilohilo ako sa baho! hahahaha… I also brought my dad and gf sa Wat Saket and for the first time ngyon ko lang din nadiscover na pwede pala umakyat sa taas! 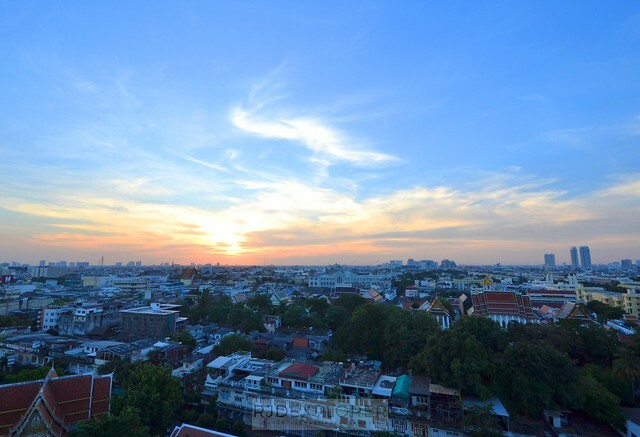 Wat Saket truly has one of the most beautiful views of Bangkok specially pag sunset na!